The Thea Sisters are five fun, lively students at Mouseford Academy on Whale Island, who want to be real, live journalists, just like their hero, Thea Stilton. Between classes, friendships, crushes, and some bizarre mysteries to solve, they find life to be a never-ending adventure! Thea Stilton was born in New Mouse City, Mouse Island. 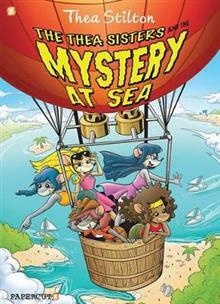 She is a special correspondent for The Rodent's Gazette, Mouse Island's most famouse newspaper, which is edited by her famouse brother, Geronimo Stilton. A graduate of the prestigious Mouseford Academy, Ms. Stilton is a visiting professor of journalism at Mouseford today. She is also the author of numerous mystery novels based on the exciting lives of her friends and former students, the Thea Sisters. In her spare time, Ms. Stilton loves to travel and go on fabumouse adventures.